“The ambulance took the old man away because he wasn’t feeling good,” my daughter tells me excitedly as I walk through the door from work. I plaster myself against the window to see if this is true. She’s speaking about my neighbor, my friend, a man who has been so kind and attentive to my daughter since the day we brought her home from the hospital. I never wanted to hear it. I didn’t want the reminder. I was always in a rush when I talked to him—late taking my daughter to school or trying to get to work with my hair still wet from the shower. He was never in a hurry. He sat on his balcony every day, his eyes magnified by thick glasses that made him look like a child. He took the time to hear us and to see us, actually paying attention to what we might say. Sometimes he seemed in awe of the world around him, observing the trees or the birds, watching the sun go down. A few days after the ambulance took him away, I learned that he was dying. All this time he knew that he was dying. He had been given a specific length of time from one doctor and then by a second one. Nyogen Roshi always reminds us that we’re dying. We’re all terminal! He says, “Old age, sickness and death . . . that’s the best hand you can hope for!” I’m shocked every time I hear this. I stuff it somewhere in the thick fog of my denial and hurry past. I check every day to see if my neighbor returns. The windows are dark and he’s not on the balcony. I buy flowers for him. 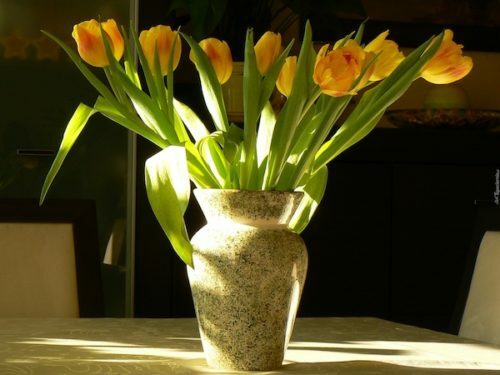 They are bright yellow, strong and optimistic in their vase. His grown children are there often, sitting on the stairs, waiting. I see his baby one day—a tall, striking woman sitting in her father’s chair. She looks scared. Days and then weeks go by. Things are being moved out of the apartment. The children have stopped coming. Then people arrive, dressed in black. They bring large white flowers and platters of food. They move slowly. There are things I wanted to tell him when he got back. He was a teacher to me, a guide. He sat there strong and steady like sunlight while I ran around carelessly. He was always delivering a message: Slow down! You’re missing this. My daughter will soon be turning 4. I have no idea how that happened. I like to watch her when she’s still and sleeping. I try to memorize something so I can keep it. There’s a shiny palm tree in my neighbor’s yard. An enormous red flower hangs from it, shedding its leaves onto the grass. I want to say goodbye to my neighbor, my friend, and to say thank you. I hear you now.